You don’t need an ice cream machine for this middle eastern inspired ice cream. 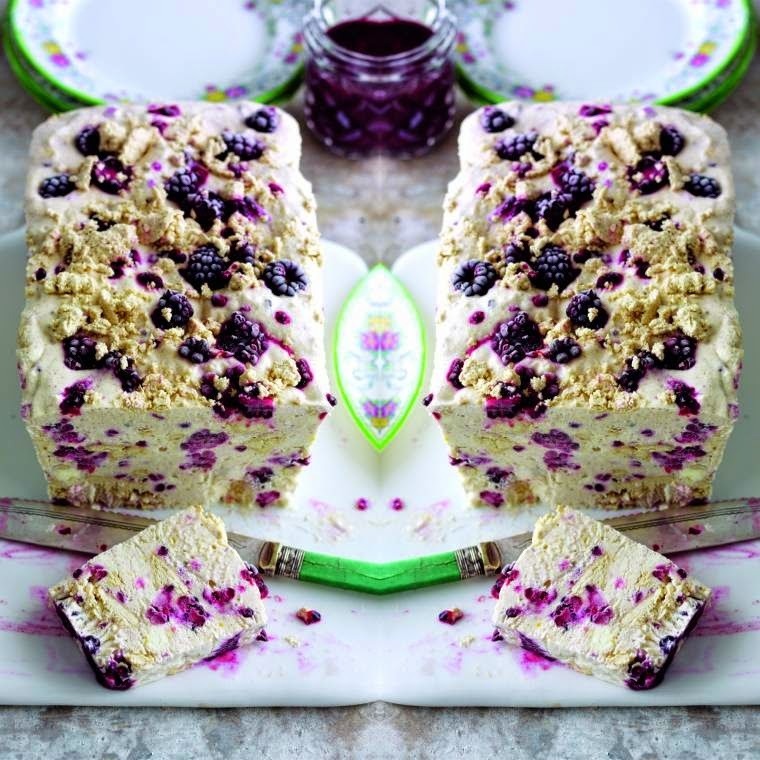 The crumbled halva adds a wonderful sweet hit balanced by the fresh fruity pieces of blackberry. Delicious served with fresh fruity blackberry sauce too. 1. Line a 1.7 litre (3 pint) large loaf tin or round cake tin with cling film and set aside. Whisk the egg whites in a medium bowl with an electric whisk until thick moist looking peaks. Add the egg yolks, sugar, orange rind and cinnamon to a second larger bowl and whisk until thick and creamy and the mixture will leave a trail when lifted up. 2. Whip the cream in a third bowl until it just begins to form soft swirls then fold the cream and yogurt into the yolk mixture. Add the halva and blackberries, keeping a few back for the top, and gently fold together then add the egg white and again gently fold together. 3. Pour the mixture into the lined loaf tin, sprinkle with the reserved halva and blackberries then cover the top with more clingfilm. Chill for 5-6 hours or overnight until firm enough to slice. 4. Meanwhile make the sauce by pureeing the remaining blackberries in a food processor or liquidiser until smooth. Press through a sieve, discard the seeds then mix with the lemon juice and sugar. Chill in a covered plastic container until needed. 5. When ready to serve, lift the ice cream out of the tin using the clingfilm then peel away and discard. Cut the ice cream into thick slices and serve with the blackberry sauce in a separate jug to drizzle over. Don’t worry about washing the whisk between the whisking the egg whites, yolks, even the cream. It is only egg whites that will not whisk if a wet or sticky whisk is used but as these are whisked first it’s fine. It is prudent for vulnerable groups such as the elderly, the very young, pregnant or nursing mums or those recovering from illness to avoid eating raw eggs. This is a guest post from Seasonal Berries. No payment was received. "Wednesday Blog Hop : Mirror Mirror…"
Yum yum! My grandma used to make halva but not with yummy berries in it. I love halva…perfect for Ramadan recipe.Thanks Claire!